President Bush on Thursday urged Americans to pray for God's guidance as the Columbia tragedy, potential war in Iraq and the constant threat of terrorism pose "a testing time for our country." "One thing is for certain, we didn't ask for these challenges, but we will meet them. I say that with certainty because this nation has strong foundations that won't be shaken," Mr. Bush said at the National Prayer Breakfast. The event is a 51-year-old tradition that brings hundreds of lawmakers, military leaders, foreign heads of state and spiritual leaders together in prayer. The crowd included 56 senators, 240 House members, first lady Laura Bush, National Security Director Condoleeza Rice, Gen. Richard Myers, chairman of the Joint Chiefs of Staff, and CIA Director George Tenet. "It is fitting that, in the midst of tough times, that these two leaders are sharing with scripture and prayer with the country," the president said of Myers and Tenet. 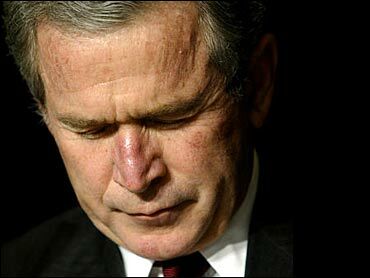 At last year's event, held six months after the Sept. 11 attacks, Mr. Bush urged Americans to turn to prayer in "this time of testing." He returned to that theme this year, saying Americans are in mourning for the seven astronauts aboard Columbia when it broke up and fell to the Earth Saturday. "This is testing time for our country," Mr. Bush said. "At this hour, we have troops that are assembling in the Middle East. There's oppressive regimes that seek terrible weapons. We face an ongoing threat of terror." Rice, following Mr. Bush to the lectern for a lengthier address, mixed humorous anecdotes about her religious upbringing with a sobering message similar to the president's. "Terror and tragedy have made us more aware of our vulnerabilities and mortality," she said. "We're living through a time of testing and consequence and pray that our wisdom and will are equal to the work before us." House Speaker Dennis Hastert, R-Ill., said, "We live in a fragile time." Columbia's demise shows that "no matter how much you train … and how much you engineer. Things happen. And they don't always go the right way," he said. The leaders spoke of Americans' uncertainty and anxiety just five days after the Columbia tragedy, and one day after Secretary of State Colin Powell laid out evidence supporting U.S. assertions that Saddam Hussein is producing weapons of mass destruction — a prelude to potential war in the next few weeks. Leading the crowd in prayer, Rice said, "Let us accept our responsibilities to defend the freedom which we are so privileged to enjoy." Mr. Bush said America will triumph over adversity because of the character of its people, the desire by all people to be free of oppression and the will of God. He said events don't move by "blind change and chance." "In this hour of our country's history, we stand in the need of prayer," Mr. Bush said. "We pray for the families that have known recent loss. We pray for the men and women who serve around the world to defend our freedom. We pray for their families. We pray for wisdom to know and do what is right and we pray for God's peace in the affairs of men." Mr. Bush, who calls himself a born-again Christian, said that in his own moments of religious contemplation he prays "for strength. I pray for guidance. I pray for forgiveness. And I pray to offer my thanks for a kind and generous Almighty God." While the prayer breakfast is a White House institution, religion has been a particularly important part of the Bush administration's identity. The president has pressed for faith to have a larger role in government. His "faith-based" initiative is removing barriers for religious groups to receive public money. He often evokes religious themes in his speeches. In the immediate aftermath of the Columbia disaster, Mr. Bush said of the seven crew members: "Because of His great power and mighty strength, not one of them is missing. The same Creator who names the stars also knows the names of the seven souls we mourn today." In his State of the Union address, the president said, "The liberty we prize is not America's gift to the world, it is God's gift to humanity." Some observers of the rift between Europeans and the Bush White House note that the president's use of spiritual phrases, while familiar here, can be jarring in the more secular atmosphere of European politics.